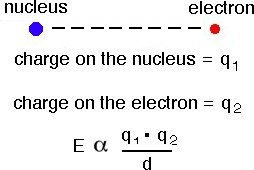 According to Coulombs Law the potential energy (E) between two stationary charged particles is approximated by the equation shown above, where q1 and q2 are the charges on the particles (for example -1 charge for an electron and a +1 charge for the nucleus), d is the separation between the charged particles in picometers (1 pm = 10-12 m). The 1st ionization energy for hydrogen is 1312 kJ mol-1. This can be represented in the following figure. In the figure above the energy level diagram for a hydrogen atom is shown on the left. The one electron in hydrogen is shown in the n = 1 level. To remove the electron (shown on the right side of the figure, 1312 kJ/mol of energy is required to remove the electron from the hydrogen atom. 1. The 1st ionization energy for helium is 2372 kJ mol-1. g) helium has twice as many protons as hydrogen.